For our 2011 Tier members, interest on your 4% payroll contributions will be credited to you on June 30th of each year as long as you are employed on that date or vested. The amount of interest is based on the value of your account (i.e. : any past contributions and past interest credited) as of July 1st of last year. Interest credits stop upon termination of your employment if you are not vested. If you terminate employment and are vested, interest credits stop at your retirement or death. 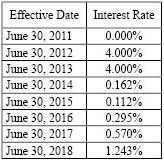 The interest rate to be used in the crediting process is the 52-week Treasury bill investment rate for the particular Treasury bill auctioned off nearest to June 30th of the prior year. Prior to June 30, 2014, the interest rate was a flat 4%. You may refer to Section 104.1091.8(5) RSMo to see the details of the interest crediting process. The following table illustrates the interest to be credited to a 2011 Tier member’s account balance. The effective date is the date the interest was credited. Copyright 2019 MoDOT & Patrol Employees' Retirement System.